TORONTO – April 11, 2019—While today’s provincial budget echoes many initiatives in education announced in recent weeks, the Ontario Catholic School Trustees’ Association is concerned that education funding after next year will effectively not increase creating considerable challenges for Ontario’s vibrant and distinctive education system. “Today’s budget confirms the government’s commitment to addressing the significant fiscal challenges in Ontario. Such an environment requires collaboration and cooperation among education partners to realize solutions and a direction forward. 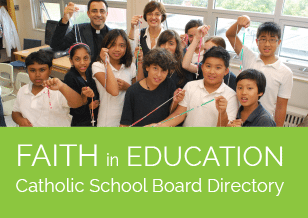 Ontario’s Catholic school boards have a long tradition of delivering quality education to meet the distinctive needs of the communities they serve. OCSTA remains committed to working with the government to inform the decisions to be made regarding education services during a period of fiscal restraint, although we have concerns regarding a number of recent announcements, including the newly announced Minister’s Task Force,” explained OCSTA President, Beverley Eckensweiler. “We will carefully review the Grants for Student Needs announcements in the coming days as those grants will provide greater detail with respect to local funding and policies. Using that data we will be able to better determine how this budget will impact education at the local level,” said President Eckensweiler.